Bascom A. Reagan, my grandfather, married Mary Eugenia Perot, on July 28, 1913, in Roswell, N.M. She was born in Campti, Louisiana on July 7, 1891. She died in Big Spring, Texas, on March 21, 1956. I have just begun the search backwards, but her branch of Perots have now been in Louisiana for almost 300 years. 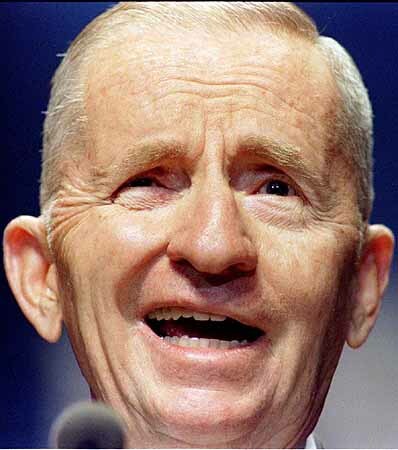 Supposedly, Eugenia's grandfather and H. Ross Perot's great-grandfather were brothers. Her grandfather's name was Cyriaque, but still haven't found his siblings because there were a lot of Perots in Louisiana at that time ... especially in Natchitoches parish. Eugenia's father was Joseph Octave Perot (1849 or 1850-8/7/1893). He married (Mary) Louisiana McKnight (b. 3/3/1855, d. 9/25/189?) on Sept. 10, 1872, probably in Natchitoches. Interestingly enough, I find both Joseph and Louisiana in the same 1860 federal census of Natchitoches, Louisiana. She's 5-years-old, and her parents are H.M.N (37,M,W), a planter with land worth $34,200 and personal property worth $54,500, and Zaline (34, F,W) McKnight (family history had her name as Zeline Fredieu). Joseph O., 11, is in the household of Cyriac (41,W,M) and Roselia (27,W,F) Perot. Cyriac (that spelling is actually Cyriaque) is fairly well-to-do as well, with land worth $10,000 and personal property worth $25,000. Coincidentally, by the 1870 census, the name is spelled properly, Cyriaque, and he's only worth $4,000 and $2,000. In 1870, Joseph (J. Octave) is 21 and still in the household as a farmer. Here's an interesting note: Roselia is obviously Rosalie Bordelon. I find Cyr. Perot marrying Rosalie Bordelon on 7/20/1849 in Natchitoches. Right under that listing is Cyriaque Perot m. Marie R. Bordelon on 8/29/1848. Did Marie die in childbirth and Cyriaque marry her sister or other relative? Did he realize he had married the wrong sister? Was Joseph, supposedly born in 1849 or 1850, actually Marie's child? Surely Cyr. and Cyriaque aren't two different people. Who knows? But at least the census confirms the household of Eugenia's father. I also find a Roselia Perot marrying Hypolite Trichel on 9/22/1855 in those same Natchitoches records. There are a bunch of Perots on that page, including Zeline Perot m. Joseph Badin on 1/20/1875. Bet that's a granddaughter of Zeline Fredieu.